The paper piece is carefully situated on top of the supporting mount board with an engaged stepped mat. Weights are used to hold down the paper, and ensure that the piece is centered through to the final step. 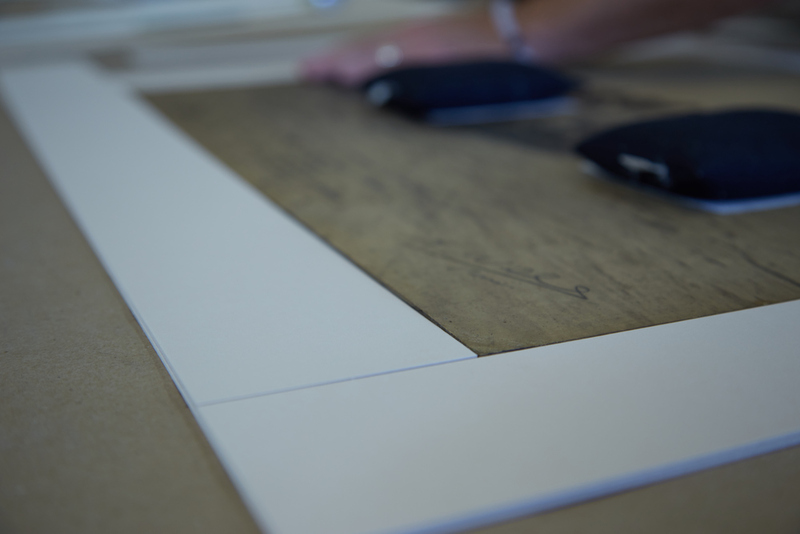 Pieces of archival mat board are cut into strips in the appropriate width tofill the area from the edges of the artwork to the outside edges of the mount board. These boards need to be the same thickness or just slightly thicker than the artwork. 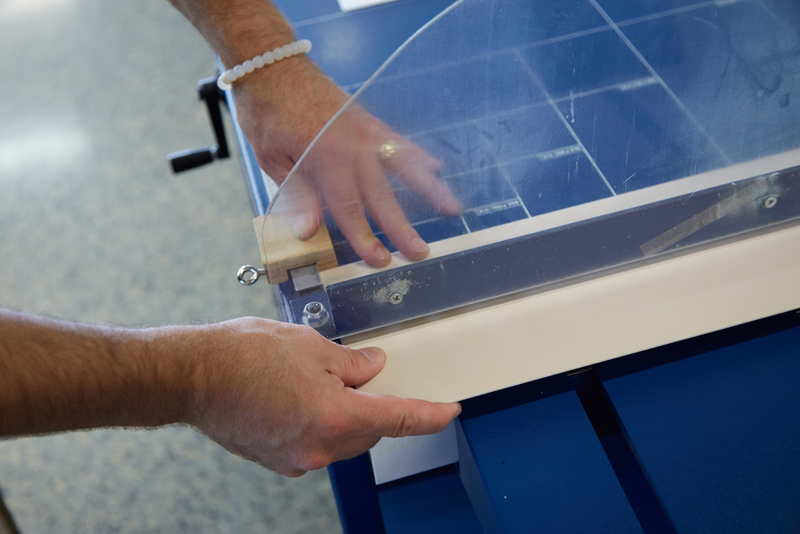 The sink mount strips are aligned to the piece to be cut to the proper lengths. 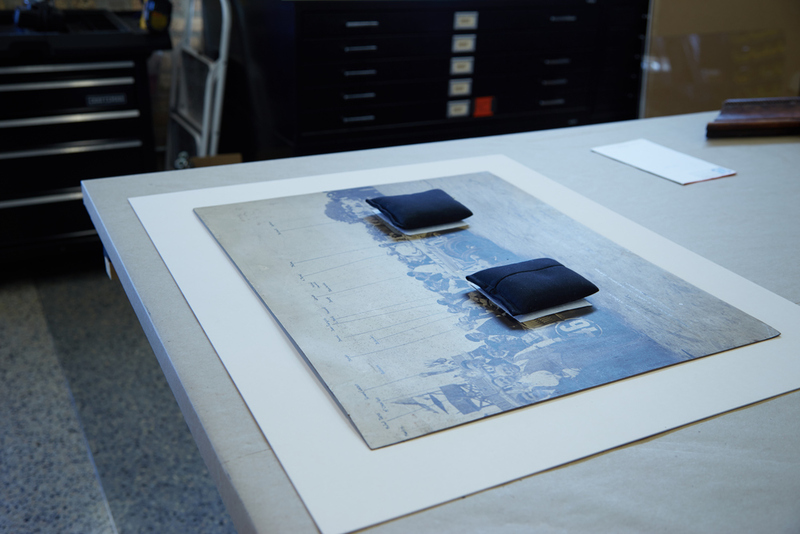 Once all sink mount strips are cut and aligned to the piece they are adhered to the mount board with archival, double-sided tape, thus creating the structural integrity needed for the chosen double mat to engage the artwork and hold it in place. Two additional mats are adhered on top of the sink mount strips to provide dimension and aesthetic appeal to the framing package. A side view of the completed sink mount shows the multiple layers enclosed, ready for installation into the frame. Proud to be an American: Preserving "Regulations for the Army of the United States, 1913"